Tour participants visited Café Loin, painted and will be demolished shortly. Arts Initiative Tokyo (AIT), a non-profit independent collective of curators and art administrators based in Tokyo, Japan, organised a one-day guided tour from Tokyo to Tohoku in May 2013. The tour gave participants the opportunity to witness the various initiatives that have grown in the Tohoku area in response to the 3.11 earthquake. 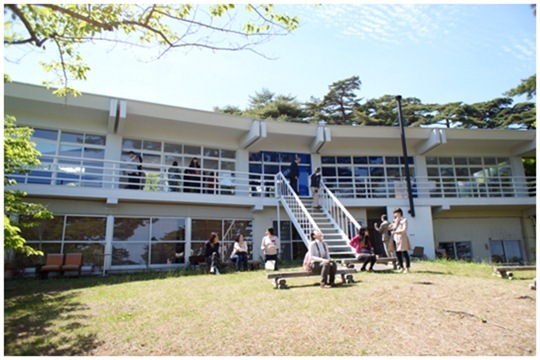 Birdo Flugas is a gallery and community space in Shiogama, Miyagi, founded in May 2006. It has taken a role as a local art platform where new art works emerge by mixing local and North American art scenes. The founder Aya Takada organised the tour with AIT. Takada talked about her experience and gave an explanation of the recent exhibition of “the Georges Rousse Art Project in Miyagi”, which she was involved in. As part of the project, French artist Georges Rousse and local volunteers drew pictures in Cafe Loin. Much loved by locals, the café was unfortunately badly damaged by the earthquake and will be torn down this autumn. Their main drawings consisted of twin stars in blue and white which represent hopes for their future and memories of the past. After seeing the exhibition, the tour participants were taken to the Café to see the exhibition first hand. Saori Tateishi talks about the changing role of the center before and after the disaster. Hiyori Art Center is an art space located in Ishinomaki city which was devastated by the disaster. Member of staff, Saori Tateishi, talked about the changing role of the space before and after the disaster. There was also a chance to see the exhibition “Hikari to Tsukuru”. It shows a range of Australian artist Richard Byers’ ink drawings of the buildings in Ishinomaki before and after the disaster. Byers stayed in an artist’s residence in the center for five months. Gota Matsumura explains how they got locals involved in “upgrading” the city. 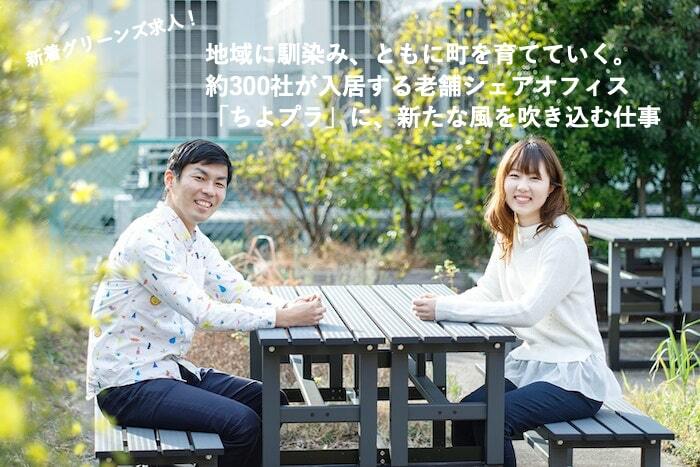 ISHINOMAKI 2.0 is an organization established in May 2011, which aims to create a new Ishinomaki with a fresh and positive environment, instead of restoring the city to its former state, before the quake. The project consists of members with diverse backgrounds such as local shop owners, NPO workers, architects from Tokyo, city planning researchers, creative producers, web directors and university students. 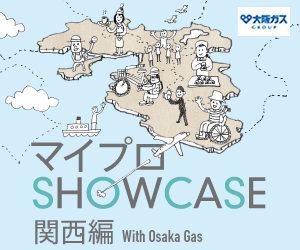 Gota Matsumura, the president of ISHINOMAKI 2.0, explained how they got locals involved, gathered people’s talents and managed them. Participants listen to Takahiro Chiba’s story with sitting on the chairs made by locals in the laboratory. Ishinomaki Laboratory is the world’s first DIY design label which emerged from Ishinomaki in response to the 3.11 earthquake. It runs DIY workshops for locals, where they can learn to build things such as benches. It provides locals not only with skills to create these products but also energises self-reliance efforts to restore and reconstruct the area by themselves. The team is collaboration locals and Tokyo’s designers led by architect Keiji Ashizawa. The director Chiba used to make furniture as hobby and he was in line to take over his father’s sushi restaurant until it was flooded. Sendai Mediatheque is located in the modern capital of Miyagi, Sendai City. It is a complex lifelong learning center consisting of a library, gallery and public meeting space to support the cultural and educational activities of local users. Kenji Kai, director of the Activity Support Department, talked about their activities after the disaster: they opened “the center for remembering 3.11” on May 3, 2011 to encourage people to come together and think about the enormous impact of the earthquake and help set out the long road to recovery. It also emphasizes archiving discussions and grassroot activities by locals in digital format for future generations. On their way home, participants gave their impressions of their experience. AIT organizes many workshops and events!